We will hopefully have French Bulldog puppies for sale this fall. 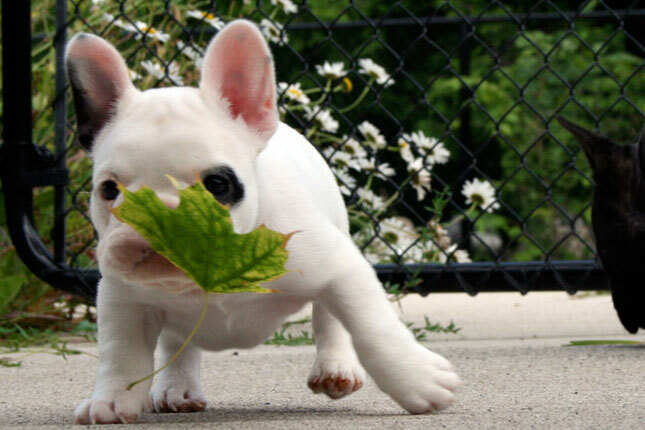 Note: before contacting us to inquire about French Bulldog puppies for sale, it’s helpful to join our mailing list. We no longer keep inquiries on file for future litters, but instead manage them via our list. Brigid has been bred to Finn – we will confirm puppies via ultrasound late June, at which time we’ll take deposits. We expect gorgeous, healthy, very intelligent French Bulldog puppies from this litter, with the potential for exceptional performance sport prospects for agility or obedience. Possible colors are brindle, black masked fawn and black masked fawn pied. Please read our information pages on our French Bulldog puppy sales policy before contacting us about purchasing a French Bulldog puppy. It will help you to understand our application process, our sales policy and what we both expect and offer our new puppy buyers. We are very particular about where our puppies go – just as we expect you to be very particular about where your new French Bulldog puppy comes from. What is a Naturally Reared French Bulldog? Read our puppy sales policy page to learn how to add a Bullmarket French Bulldog puppy to your family! Want us to contact you when we have puppies available? Litter announcements and details on available French Bulldog puppies for sale will be announced via our mailing list – join it to make sure you don’t miss details on your perfect puppy! Looking for French Bulldog Rescue in Canada, either to adopt a French Bulldog or get help for a Frenchie in need?